The 2016 edition of the Thor Winter Olympics (Mini Os) at Gatorback Cycle Park in Alachua, Florida, wrapped up on Saturday, with Justin Cooper (250 Pro Sport and 450 Pro Sport) and Sean Cantrell (250A and 450A) taking home victories. For a full rundown of all the champions, check out Wake-Up Call. Collin Speckner got a few moments with the winners. Racer X: Justin, congrats on winning the 250 Pro Sport and 450 Pro Sport motocross titles at the 2016 Winter Olympics here at Gatorback Cycle Park. Can you take us through your motos from today? Justin Cooper: We came in with some solid top-two finishes, just tried to wrap it up and get some of the titles at least. We got off to some pretty good starts and made some pretty good passes today. I’m happy with the way I rode, thankful to get out of there in one piece, and walking away with three titles. Is there anything special you did this winter to prepare for this event? Actually, it's been a rough road since Loretta's, but I've been going to some of the big races in the Northeast and I've been doing good in those so I came in here with some confidence, it worked out. What’s next after Mini Os? Are you planning on doing arenacross, supercross, maybe some outdoors? Yeah I’ll definitely be going to arenacross this winter get some more experience for supercross in 2018; just try and make myself a better rider going through there. Racer X: Sean, congratulation's on your 250A and 450A motocross titles here at the 2016 Winter Olympics. Can you take us through those motos? Sean Cantrell: Yeah, man, they were good. We started off really well and ended with a little bit of a bummer, crashed in the start. 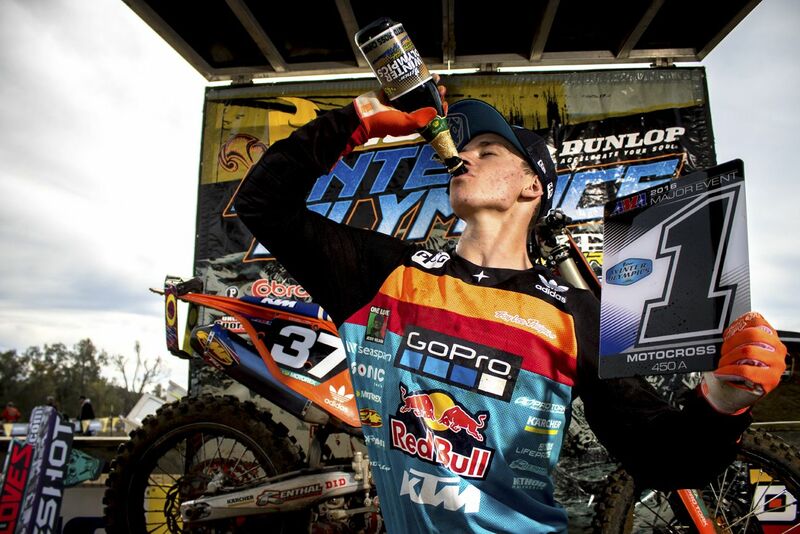 The 250A and 450A titles were good to get, riding the KTM 250 SX-F in the 450 class was tough, but made it happen. Got some good starts; [I got] good starts all week. I'm happy with the way I rode, now back to the drawing board. Go back home, keep grinding, keep working, and get ready for the next race. In the 450A moto, I saw on the gate something looked like it was wrong with your throttle, what was going on there? Did you get that fixed or was it something you had to ride with? Yeah, right before the gate drop in that moto, I started the bike up and I was revving it a little bit, just for some reason the throttle kept sticking. I called my mechanic back over, we thought we fixed it, but right before the gate drop I revved it one more time and it was still sticking so that moto was a little tougher because I had to turn the throttle back over to let off the gas. That was a little tough, but got through it, came back and changed the bike, and was ready for the next moto. Good job to the team for getting through adversity and getting ready for the next moto. Did you do anything special to prepare for this event? I started working with Tyler Kalisiak after Loretta's this year. For Monster Cup I've been working with him and ever since then just grinding, cycling, in the gym all the time. Just getting stronger every day. Day by day, week by week, working hard trying to get to that next level. I mean its crazy what us motocross riders have come to, but it seems to be working, just going to put a little more effort in and get ready for Hangtown. I couldn't be more stoked for the program that we have.